THERE IS uneasy calm at Ada-Foah, a farming community in the Ada East District of the Greater Accra Region, over plans by some individuals to install a new chief in the area. Kingmakers of the area have allegedly threatened to 'arm' and 'defend' themselves if immediate steps were not taken to properly address the problem. Addressing a press conference at Ada-Foah, Acting Mankralo for the area, Asafoatse Keke Zormabi IV, who could not hide his frustration, alleged that the District Assembly is backing an incoming chief whose position is being contested, at the expense of the current peace being enjoyed in the area. According to him, the supposed candidate who is being groomed to take over the stool from the late chief of the area, Nene Nanor Dugbatey Tetteyga V, is not an indigene of the area. He claimed the rightful gate amongst the 13 gates in the area, to present a new person for consideration of a chief is the Dugbatey family. Asafoatse Zomarbi IV indicated that in spite of a court injunction placed on the installation of the new chief, there are still attempts to go ahead with the installation. He warned that they will resist any attempts by any group of persons who are trying to 'jeopardise' the peace of the area. However, the Ada East District Assembly and the police in the area have denied having a hand in the installation of a chief in the area. 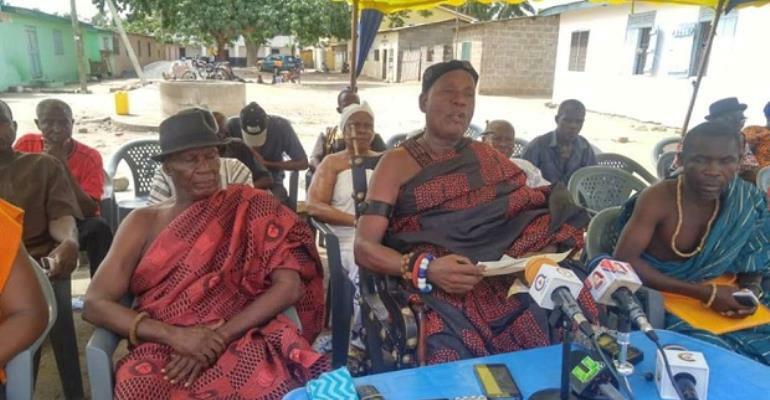 Meanwhile, the Ada Foah Traditional Council has dissolved the incumbent cabinet of the late chief to pave way for the formation of a new cabinet to oversee the day to day affairs of the traditional council. The outgoing council has also been instructed to present financial statement on all transactions conducted in the area including accounts on sale of stool and family lands and all other agreements made in relation to land acquisition and lease. Caption: Ada-Foah, Asafoatse Keke Zormabi IV flanked by some kingmakers while addressing the media.